This post is the third article in a series reporting the results of a research project funded by the North Carolina Soybean Producers Association through the soy checkoff to begin to answer the question “are fungicide applications a smart investment?” To do so, the project examined the cost of each product coupled with the application cost, and compared that to the increase in yield above the untreated check. The assumptions were that the application cost of each treatment regardless of product was $8.00 and the price per bushel was $9.00. The total cost of each treatment including the product plus application cost was subtracted from the value of each treatment (yield times price) to determine the net value. These values were compared to the untreated check to determine the net gain or loss in profit per acre for each treatment. There was a net gain for many of the treatments in 2014, but in 2015 the same treatments end up resulting in a loss. 2014 had moderate FLS development. This was probably a combination of cool, humid conditions and the susceptibility of the variety planted. 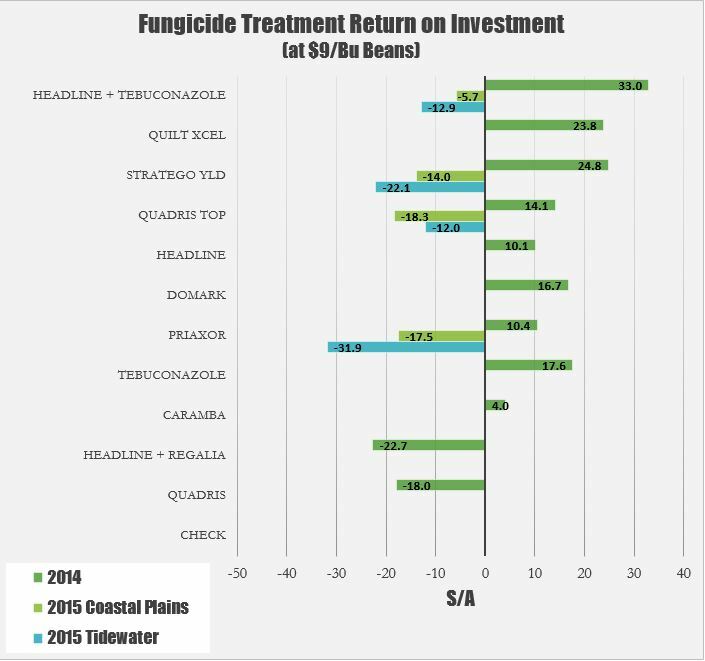 2014 saw a significant yield advantage when applying 8 of the 11 foliar fungicides tested. 2015 had almost no FLS incidence. This was probably a combination of the hot, dry summer and the genetic resistance provided by variety planted. 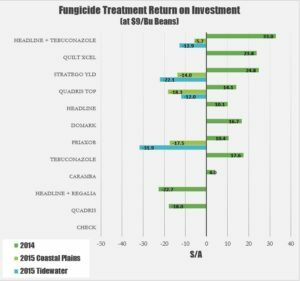 In 2015 there was no advantage to applying foliar fungicides at any of the three growth stages examined. For most products tested in 2014, there was a decent return on investment, while the products tested in 2015 resulted in a net loss. Going back to the initial question “Should I apply a foliar fungicide and if so when?”, the answer is “it depends.” Unfortunately, that may not be an easy answer to hear, but the data collected over the last two years is a perfect example of the complexity of the decision-making process. 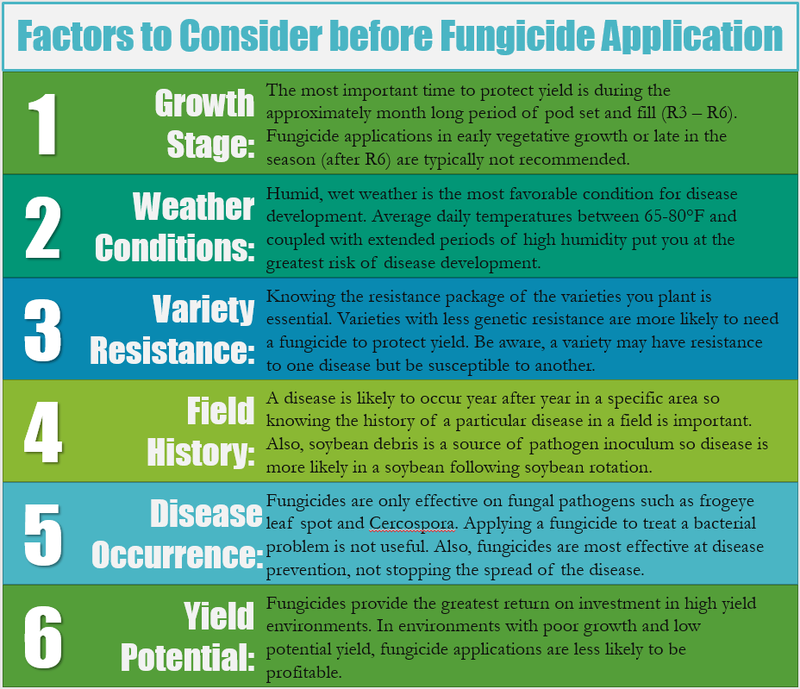 A number of factors should be considered to make an educated decision about whether to spray fungicides. These include current growth stage, weather conditions over the last few weeks, genetic resistance of the variety planted, history of the field, disease occurrence and overall yield potential. Each of these is explained in further detail in the chart below. The more of these risk factors that occur, the greater the chance a fungicide application will be profitable. In addition to these factors, the cost of the treatment and the price of beans should be considered when making a decision. In years where commodity prices are low, a much higher yield response to the fungicide treatment would be needed to cover the cost of the treatment than when prices are higher. 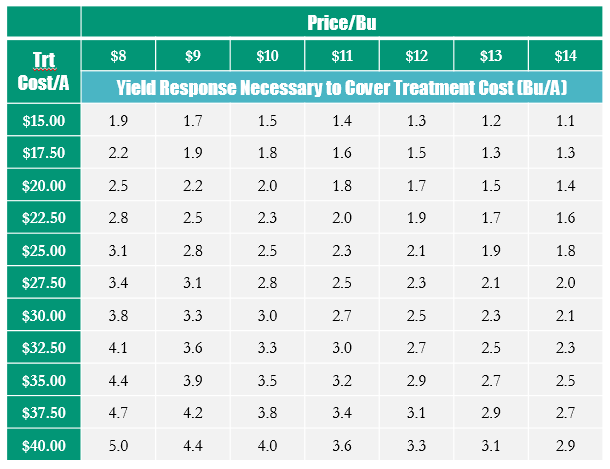 A quick reference chart of yield response necessary to cover the treatment cost is below. Based on the data presented here, it is reasonable to expect to see a much greater yield response when weather conditions are conducive to disease development. In addition to the factors above, it is also critical to incorporate fungicide resistance prevention into treatment decisions. Strobilurins are a class of fungicides that are considered at high risk for resistance development and there has already been some FLS strobilurin resistance in the northeastern part of the state. Widespread use of the same fungicide class application after application increases the selection pressure on the pathogen, which in turns accelerates resistance development. Just like it is essential to rotate mode of actions or even tank mix mode of actions with herbicides, the same is true with fungicides. The steps you take now will determine the options available for pest control in the future. Are foliar fungicides right for your operation? Think about fungicide applications as a management approach that can be incorporated into a production program on a year-by-year and even a field-by-field basis. There are definitely times when fungicide applications will be of benefit, but the circumstances must be carefully evaluated before deciding to spray. Hefty, B. 2012. Foliar Fungicide in Soybeans. http://www.agphd.com/ag-phd-newsletter/june-2012/2012/06/04/foliar-fungicide-in-soybeans/. Mehl, H. 2015. Foliar Fungicide Applications in Soybean. https://blogs.ext.vt.edu/ag-pest-advisory/foliar-fungicide-applications-in-soybean/. Jeschke, M. & R. Ahlers. 2012. Foliar Fungicide and Insecticide Use in Soybeans. https://www.pioneer.com/home/site/us/agronomy/library/foliar-fungicide-insecticide-soybeans/. **Special thanks to Tidewater Agronomics Inc., McLawhorn Crop Services Inc., Fowler Crop Consulting Inc., Protech Advisory Services Inc., and IMPACT Agronomics, Inc. for these experiments.